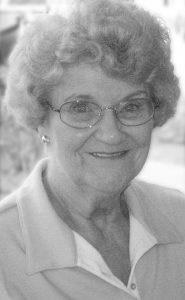 EILEEN BRENDA CASHMORE, passed away at the St. Michael’s Health Centre – Palliative Care Unit, on Tuesday, March 5, 2019, with her children by her side. She is survived by her children Sarah (Jeff Goldie) Cashmore of Edmonton and Simon (Germaine) Cashmore of Calgary. She has six grandchildren and four great-grandchildren. Eileen was predeceased by her husband, Philip. Eileen was born in Burton upon Trent, England on October 16, 1932. After a bout of tuberculosis which saw her hospitalized for 18 months, she became a nurse. It was while nursing she met her future husband Philip, an orthopaedic surgeon. They emigrated to Canada in 1965 and spent four years in Hamiota, Manitoba. In 1969 they moved to Lethbridge where they lived the rest of their lives. Eileen was very active in Lethbridge community theatre and worked on a great number of shows with Lethbridge Playgoers, Lethbridge Musical Theatre, Centre Stage, and the Lethbridge Symphony. In addition to theatre, Eileen enjoyed fencing, and worked on several political campaigns at the federal, provincial, & municipal levels. A Celebration of Eileen’s Life will be held at the GALT MUSEUM & ARCHIVES, 502 – 1 Street South, Lethbridge, AB, on Saturday, March 23, 2019 from 5:30 P.M. to 9:30 PM. In lieu of flowers, the family request donations be made to the Alberta Birds of Prey Foundation in Coaldale. Eileen loved to visit and see the birds and was a long-time supporter of the centre. Donations can be made to 2124 – 16 Avenue, Coaldale, AB, T1M 1J8 or online at http://www.burrowingowl.com/support/donate.php and a donation basket will be available at the celebration of life. My heartfelt condolences to you. Your mother was a very kind and loving person who will be missed.